When all you need is a basic understanding of the human nervous system, look to Cram Session in Functional Neuroanatomy: A Handbook for Students & Clinicians. This handbook gives you basic information in a readily accessible format, as well as more detailed concepts that will allow you to better understand not only how the human nervous system works, but how injuries and disease affect experience and behavior, including cognitive and intellectual functions. 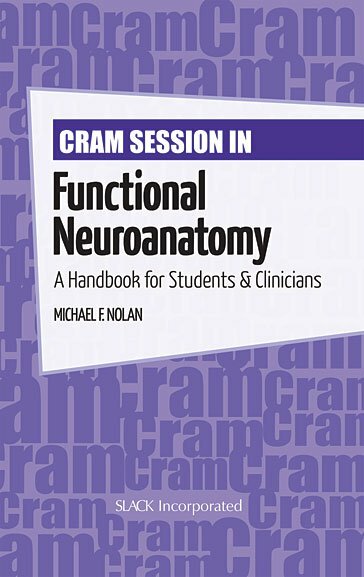 Cram Session in Functional Neuroanatomy: A Handbook for Students & Clinicians by Dr. Michael F. Nolan is a concise and illustrated quick reference that highlights important anatomical and physiological principles of the nervous system. These key points will enhance understanding of the nervous system and how specific populations of nerve cells and neural systems influence human experience and behavior. Cram Session in Functional Neuroanatomy: A Handbook for Students & Clinicians is a perfect text for physical therapy students and other medical and health professionals in neurology and neurosurgery. Michael F. Nolan, PhD, PT received a bachelor’s degree in physical therapy from Marquette University and a PhD in anatomy (neuroanatomy) from the Medical College of Wisconsin. Dr. Nolan is Director of Assessment at the Virginia Tech Carilion School of Medicine and Research Institute in Roanoke, Virginia, where he holds the rank of Professor in the Department of Basic Science. He is also Professor Emeritus of Pathology and Cell Biology at the University of South Florida, where he received numerous teaching awards for both undergraduate and graduate medical education, including the John M. Thompson, MD Outstanding Teacher Award in Neurosurgery. He is the author of Introduction to the Neurologic Examination and Clinical Applications of Human Anatomy. Instructors: Visit our new website especially for you at efacultylounge.com! Through this website you will be able to access a variety of materials including, Cram Session in Functional Neuroanatomy , Instructor's Manual.